So Sunday was our family day, and our first stop was a walk along the rocks between Takapuna and Milford. Such a fun and interesting walk for the little one. We came across this stone chair/thrown along the path. Such an awesome structure against the stone wall facing out to the sea. ...and just generally running and splashing around exploring. Gosh, it was lovely out on the rocks. Despite our best efforts to remind him not to get too wet by going too deep or sitting in the pools he couldn't help but get himself completely soaked. Kien picked flowers on the route back to the car. We then headed home for some lunch before heading out again with our brand new fishing rods for a comfortable spot sheltered from the wind, which by now had picked up considerably. We first went to the wharf at the Tank Farm, but we weren't sure if we could fish there. So we went to Ponsonby Wharf on Wairangi Street in Herne Bay, but when we got there it was windy and cold. So we decided to drive to Birkenhead Wharf where it was more sheltered. But when we arrived there the security guard said there was no longer any fishing allowed there (that's so disappointing). So we went to Fisherman's Wharf in Northcote. Yes, the long list of "do nots" did not include fishing. Nice little spot, although we didn't catch a thing. We went home and did some deck grilling. It was an experiment a week ago that went considerably well, and it means we can enjoy some chargrilled meat easily, hassle free. 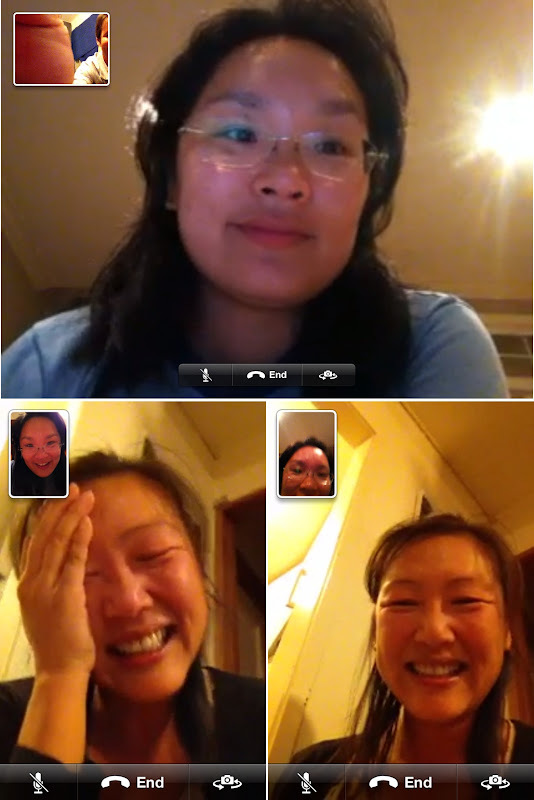 I also did some FaceTime with my friend in the US for a few hours. If you didn't know by now I LOVE TECHNOLOGY. As I try to do with all our holiday videos I've made a movie - a snap shot of our experiences wrapped up in a 5 minute short film. 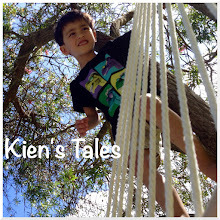 Not only is it a good way to reminisc without having to go through hundreds of unsorted photos and video clips, but Kien loves to watch them - over and over and over again. This is how he remembers what he has experienced in his life, and I love that am creating and sharing those memories. It's been a little hard getting back into the comfortable rhythm of everyday(ness) after our holiday. But we've been back for two weeks, and only this weekend did Jef put all the bags at the front door ready to go back into storage. Kien has been waking constantly every night - prior to going away we had him sleeping through the night for an entire week! I've hardly taken the camera out from the case, and the Steve Jobs biography has had me curled up in bed with my iPhone not soon after I've put Kien to bed...and now the duty free gin bottle is half empty. I'm not feeling down or anything like that - I'm just, well, hibernating, I guess. It's a bit of a shock to the system coming back to the winter, even though I must admit that the days are noticeably a little longer and it really hasn't been that cold. Jef and I left the kid in daycare last Thursday and drove up to Dargaville for Jef's great uncle Mostyn's funeral. As far as funeral services go it was a good one; lovely stories of a man who lived a long and fulfilling life, touching and making other peoples' experiences around him richer and fun. I first met him a few years ago at his birthday, held in the same place as the service on Thursday. Even at ninety something uncle Mostyn was witty and spritely. Jef's family is vast on his father's side - lots aunts, uncles and cousins. Lots of fond tales of family summer adventures at Glinks Gully. Plans are in the pipeline for a re-union and the creation of new family traditions. Here's a neat video Jef's cousin Jacki shared on Facebook. Here's the link to the youtube clip if you are having issues seeing it here. On Saturday I took Kien to Baby Loves Disco for the very first time. It was an event run in conjunction with Ponsonby Plunket. I think if Kien was a little older this would have totally been his thing, but instead he mostly wanted to experience the event on my hip, which made it a little tricky for either of us to enjoy it. Plus, OMG the place was packed! I honestly did not think these events were that popular - boy was I wrong! I don't think Kien is 100% well either - although there is nothing obviously wrong per se except for a slight runny nose. But Oh Brother, has he been whiny and cranky, and the constant nightly waking up makes me suspect teething (is that possible with already 18 of them through?). Sunday - my birthday. I spent the morning in bed while Jef attempted to tidy up and look after a clingy toddler, and he made me a lovely coffee. We then decided we should go out for dinner, so we needed to sleep the toddler so he could last a little longer in the evening. You know that when you try engineering a toddler to sleep when you want him to - it doesn't quiet go the way it is supposed to. 1 hour of driving on the motorway south and then turning around and driving north until you get to Albany before the boy finally closes his eyes! We park up at Jef's work, he fetches me a coffee, I'm editing a movie, and the toddler wakes up 30 minutes later. So we drive back home, Kien drifts back to sleep, and we spend the next hour in the car reading. Then Kien wakes up and has a tantrum because his mother took him out of the carseat instead of his dad. Hey, at least I can see the funny side of this story. I went off for a run to the Harbour Bridge via Westhaven Marina and back, and then we hopped on a bus to Queen St for dinner. Tanuki Sake Bar - always a great place to dine. We caught a Link bus back to Ponsonby, stopped into One2One for drink and enjoyed the gig for a bit. Made me feel a little inspired to pick up my guitar again! All good things must come to an end, and so it was that we had our last day in paradise exploring the highest hill on Aitutaki, Mount Maungapu, which gives a 360 degree view of the Aitutaki lagoon and island. From here we observed the spectacular triangular lagoon, the turquoise water, white sand beaches and neighbouring uninhabited motus (small islands), and Aitutaki airfield. That last night we had dinner at The Boatshed, another fantastic dining experience on the island. The wind continued to whip the island through the day and into the evening, and therefore we enjoyed the view from inside. We were on the first flight to Rarotonga the very next morning. We said good-bye to Aitutaki. First stop: the Saturday markets, since they shut down at midday(ish). We didn't think we would make it, but we did, and we got stuck in to some lovely BBQ'ed meat skewers for lunch. I like seeing little chicks running around at the markets. They were busy, just like these markets. We had to get around the island somehow, and as we were no longer in Aitutaki we could not do three-up on a scooter with Kien sandwiched between us, so we got a little convertible to get us around instead. This little vehicle is so damn cute! We whizzed around the island finding nice spots to stop at. Over on the "quiet" side (not the Avarua to Muri lagoon leg) we stopped and threw some coconuts in this lovely bay that was sheltered from the relentless wind hitting the other side. In the evening we met up with Leo and Gabby (whom we bumped into at the markets) for the closing of Te Maeva Nui - cultural festival of music and dance, and celebration of the constitution. Really good to see them again! When we said good-bye at the beach huts we were not sure whether we would/could find each other in Rarotonga. We had dinner and watched one full performance before having to quickly get Kien back to the room to sleep. He was exhausted and definitely showing signs that he had had enough. Early morning on Muri beach, and I decided to take Kien for a stroll on the sandy shores of the lagoon. My boy has definitely matured during our time away. His sentences are so much more comprehensive, and he is so much more aware of what is going on around him. We have had to engage and develop his reasoning and negotiation skills; living within such close proximity with others means we have been hyper aware of his noise (whinging/whining) level. We drew helicopters in the sand. The wind died down and the sun came out the last day we were in Raro. We enjoyed a bit of time at Muri beach after we checked out of our accommodation. Kien plucked up the courage to go on the rope swing. To be honest he enjoyed it a lot more riding with his daddy. Then it was time to head out to the airport. We caught the clockwise route bus and stopped in the main township of Avarua. It was Sunday, so almost everything was closed. Kien fell asleep on he bus journey, and Jef had the pleasure of holding him, so I was able to go for a walk around the quiet streets. Kien was happy after his nap. And then soon after it was bye-bye to Rarotonga.